So you can decorate the Christmas table The dining table can be decorated in many ways at Christmas. I particularly love this decoration because it has neglected the red color used on a regular basis to dress the dinner table this season. 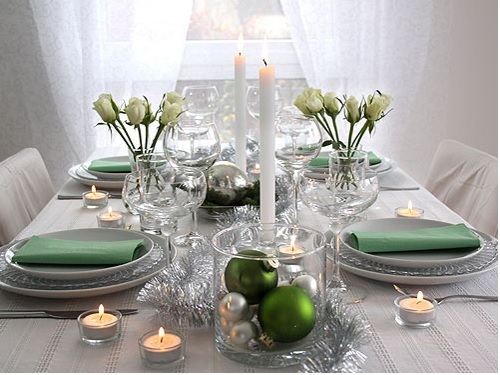 So for a change we have chosen white, green and silver for decorating the table for Christmas dinner. The other days you can use the red decoration, another day golden decoration. You can play and vary with table decoration. In a glass container by you can play with the ornaments and put some shiny gold and green areas. Furthermore candles placed in container similar to photo small glass. You can also add two large candles placed to make the table more lights. Place some extensions of showers and decorative vases containing white flowers, aroma make Christmas dinner even more exquisite.